We had a moment of Disney-magic with a cast member named Gary. 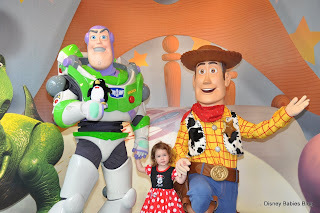 We rode Toy Story: Midway Mania. After we got off the ride, Piper was walking outside and a lady was rushing to get a fast pass and knocked her to the ground. Piper hit her head on the concrete. A cast member named Gary was amazing. He noticed us sitting trying to console her crying while we held ice on her head. He came over, asked what happened, and tried to console her, calling her “princess”. Then he left and came back holding Wheezy, the penguin, and asked Piper if she wanted to take him home with her. I thanked him, and told him he didn't need to do that. He said that he would "gladly give away all of Disney's merchandise if it meant keeping a little girl from crying." She kept saying, “Buzz”, so Gary said he would try to see if he could get Buzz to meet her. He came back and said that, when she was ready, Buzz and Woody would love to meet her. The line to meet them was 45 minutes, but he brought us in a side door, and she had an awesome meet and greet with them. 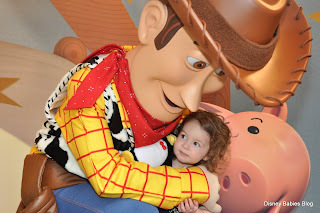 Buzz kissed her head, and Woody loved her Woody pin. Gary went above and beyond his job to make a little girl feel better and it brought us to tears. Every time she looks at Wheezy, she says, “Nice man.” She knows a nice man gave him to her. We made sure to go to customer service later that day and we filled out a form about what happened so Gary would get recognition. I hope he knows how much it meant to us. Wherever you are, Gary, you made our vacation so magical, and we thank you! Have you ever had a Magical Moment during your vacation? This seriously brought a tear to my eye. Disney is a phenomenal place in and of itself, but the Cast Members truly make it magical! The "nice man" part brought a tear to my eye. Thanks for sharing the Disney magic. My friend and I went to Customer Service to ask a question (at Epcot), the cast member said we didn't have enough buttons on and proceeded to give us almost one of every pin! And yes, we did put them all on! Having dinner at 50's Prime Time, we met the chef as I have food allergies, he spend more than the usual time with us, my friend was on her first visit and he came back to the table with glow in the dark Tinkerbell pins for both of us, and again we wore them for the rest of the day. I love the nice man and how he helped change your daughter's day. 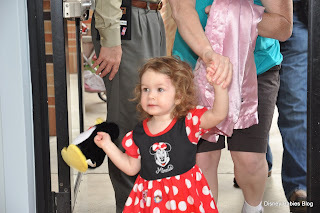 Great story, and some people don't understand why we go back to Disney year after year. Try these disney florida resident deals at http://disneyfloridaresident.com/!